Absinthe was a popular drink in the cafés and cabarets of Paris and Montmartre in the 19th century. The Hotel Royal Fromentin Paris explores the history of absinthe in a book written by Marie-Claude Delahaye, author of numerous works about absinthe and founder of the Musée de l’Absinthe in Auvers-sur-Oise. Let your imagination wander as you sip a glass of absinthe in the authentic bar of the former Don Juan Cabaret. Discover the absinthe ritual just as Van Gogh, Toulouse Lautrec, Baudelaire and so many others did before you. Here are some excerpts from this book now available at the hotel. Discover our quartier the way it was during the exciting period, la Belle Époque, at the end of the 19th century. In the heart of Paris, in a neighbourhood steeped in history, the Hotel Royal Fromentin is the ideal spot to step back in time and discover absinthe. It was indeed a tradition in this area of Paris where the Belle Époque poets and artists gathered, leaving a rich artistic legacy. At the junction of the famous quartiers of New Athens, Saint Georges and Montmartre, the rue Fromentin witnessed artists, poets, writers and performers on their way to the numerous cafés and cabarets in the area. And absinthe, the fashionable drink at the time, was served everywhere. Often called “the Green Fairy” or “the Muse”, absinthe was the inspiration of many an artist. Absinthe vapours floated in the air, their heady anise scent escaping out on to the Grands Boulevards where cafés flourished and the atmosphere was carefree. From one café to the next, noisy groups of revelers made their way, sustained by numerous libations. The lobby of the hotel, formerly the Don Juan cabaret, has preserved all the charm of its origins with its wooden beams and painted wood paneling, its two great chimneys and its caryatids. Settle comfortably into one of the armchairs, in the heart of this quartier where so many famous artists once lived. Let your imagination wander down its streets where the fragrance of absinthe seems to linger magically yet. Absinthe, a legendary spirit sung by great poets and portrayed by the most illustrious of painters, appreciated by all, and finally outlawed in France in 1915, absinthe today is experiencing a rebirth. The Green Fairy has not cast her last spell! Worshipped but then banished, accused of driving men mad, absinthe today, without its most harmful ingredients, no longer presents the neurotoxic dangers of its 19th century version. Originating in Switzerland in the canton of Neuchâtel in 1798, the result of an old woman’s interest in mixing the plants she found on the mountainside, absinthe was brought to France in 1805 by Pernod and became the popular beverage among the bourgeoisie and the artists. It was the fashionable drink, more expensive than wine until about 1860, when the working classes began to acquire a taste for it. More common, cheaper and often falsified, the Green Fairy became the Wicked Fairy, blamed for all the ills of humanity. Outlawed, absinthe was abandoned by history for a century before new generations began to take interest in it once again. 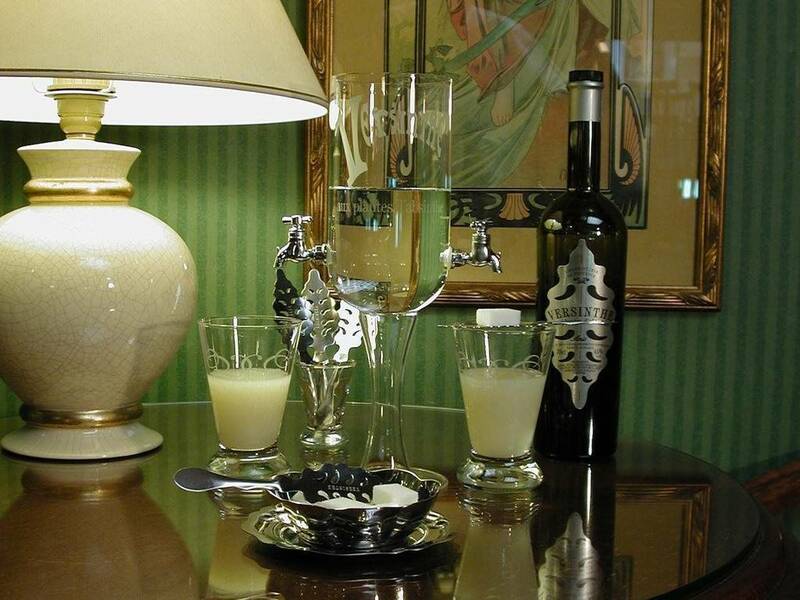 Discover the Convivial Absinthe Ritual. When staying at the Hotel Royal Fromentin, you too can experience this extremely convivial ritual that made absinthe so popular a century ago. An aperitif drink with anise flavour served with ice water, absinthe was prepared in a very elaborate manner which made the cocktail hour so unique that it became known as the “green” hour. “Mystify” your absinthe by pouring it into a glass and then placing a slotted spoon with a cube of sugar on the rim of the glass. Let the water penetrate, drop by drop, slowly dissolving the sugar into the absinthe. A veritable alchemy occurs between the water and plant essences as pale green swirls spiral up through the glass. The pleasure, first visual, becomes aromatic and slowly prepares the palate for a taste experience. The green-eyed muse thus set free will release your imagination. You are now ready to embark on the discovery of this mythical « quartier » where so many famous artists savoured absinthe before you. A Stroll through Time … As you leave the hotel, head toward the Place Blanche, have a look at the Moulin Rouge where Henri de Toulouse-Lautrec sketched la Goulue, Valentin le Desossé and all the colourful characters that frequented the famous music hall. Toulouse-Lautrec drank small quantities, but very often, and was never seen without his cane and its incorporated flask and glass. Since he loved absinthe as much as cognac, he concocted for his friends, singers Yvette Guilbert and Aristide Bruant, a powerful mixture of his two favourite drinks which he dubbed “the earthquake”! In 1896, Toulouse-Lautrec lived in a room just down the street from the Hotel Royal Fromentin at number 30 rue de la Fontaine. Previously, between 1887 and 1893, he had lived at number 19 with his childhood friend, Doctor Henri Bourges. If you continue down rue Henner, have a thought for Guillaume Apollinaire who lived on the second floor at number 9 from 1901 to 1907. Although he had nothing against absinthe, he did not mention it in his anthology “Alcools” in 1913. Further along, you will arrive at the Square La Bruyère where George Sand lived in 1841 in two cottages surrounded by a big garden; she sublet one of the cottages to Frederick Chopin to facilitate their passionate liaison. Delacroix came to the Square La Bruyère to give painting lessons to her son Maurice for eight years. Delacroix would be the only member of a jury to vote in favour of Manet’s Absinthe Drinker which was refused at the Salon of 1859. Now take the rue de la Tour des Dames. Vincent Van Gogh lived at number 8 on the fourth floor in 1890. He had taken refuge in his brother’s apartment there for several months before leaving for Auvers-sur-Oise where he committed suicide on July 27th of the same year. Converted to absinthe by Toulouse-Lautrec and Gauguin, he spent many nights with them at the café Le Tambourin. Van Gogh whose dream was to have his works exhibited, wrote to his brother: “One day or another, I will find a way to do my own exhibition in a café.” These words are particularly significant and demonstrate the difficulty artists had showing their works as well as the important role the café played in the cultural life of the 19 th century. As you reach rue St Georges, look up to the fourth floor of number 43. Perhaps you will get a glimpse of the Goncourt brothers on their balcony. They lived there from 1850 to 1868 observing and describing the lives of their contemporaries. Suffering from terrible headaches, they were in the habit of putting laudanum in their absinthe, a veritable “liquid hashish” to use their words. Baudelaire was a regular customer of the Brasserie des Martyrs and as soon as he arrived, he would ask the waiter to remove the carafe of water on the table next to his. “I find the sight of water unbearable.” he would say gravely. He would order wine and quickly down four or five glasses or would absorb successively two or three absinthes with the same nonchalance. At number 14, rue Clauzel, artists regularly crowded the shop of le Père Tanguy, the paint manufacturer and merchant for the Impressionists and the Nabis. His paints in tubes were the rage, for they gave the artists much greater freedom from their studios. When he arrived in Paris in March 1886, Vincent Van Gogh became a regular client of the shop where he met Cézanne and Emile Bernard. And Guy de Maupassant, famous author of short stories, lived at number 17. Now take rue Victor Massé. Number 12 was where Rodolphe Salis transferred in 1885 his famous cabaret Le Chat Noir which was initially located at 84 Boulevard Rochechouart. He was joined by poet Emile Goudeau, founder of the Hydropathes club for whom the sight of water was considered unbearable! Famous singer Aristide Bruant, who had purchased from Salis the original Chat Noir, made it into his own cabaret, the Mirliton, immortalized by the poster by Toulouse Lautrec. At the Count’s request, the sculptor Clesinger did a moulding of Apollonie’s body and made the statue “Woman Bitten by a Serpent” which created a scandal at the 1847 Salon Baudelaire was also in love with Apollonie and sent her, anonymously for five years, his most beautiful love poems. At Apollonie’s dinners, Baudelaire met many other artists and writers including Delacroix, Berlioz, Dumas father and son, and Alfred de Musset. De Musset, a chess player and absinthe drinker, was a member of the prestigious Académie Française. The remark was made to the secretary of the Académie that Musset missed the dictionary sessions rather often. The secretary replied, “You mean to say that he is often absinthe! This stroll through time has perhaps fuelled your imagination about this period of history at the end of the 19th and beginning of the 20th centuries. Painters and poets lived in this quartier and took the “sip of seduction” from the Muse, the enticing Green Fairy. It was an era when the very word absinthe evoked scenes of smoke-filled cafés when artists met to redesign the world. It was also a time when numerous Parisian cabarets competed with each other to recreate an atmosphere that would lure the nocturnal. Some were romantic, others sought to provoke. And some were outright anti-clerical like the cabaret the Abbey of Thélème. Anticlericalism was also the tone at the former Don Juan cabaret which existed until the 1950′s and which has now become the lobby of the hotel. At the reception notice as you enter above the two steps that take you down into the lobby the painted wood paneling representing in the form of a triptych, the scene of the Annunciation to the Virgin Mary by the Archangel Gabriel. Notice as well the chimney of the lobby, which was originally open as it is today. Some historians claim that it is a replica of the chimney in the Chat Noir cabaret. The open hearth, typical in this era of anticlericalism in France, symbolized Hell from which appeared, through a wall of veils and silk “flames”, young dancers in very scanty dress. They were meant to spice up the atmosphere as they mingled with the clients of the Don Juan who apparently included a number of illustrious poets, painters and artists who enjoyed the show as they sipped their absinthe.